This year marks the 150th Anniversary of the Civil War in which some 618,000 Americans died. 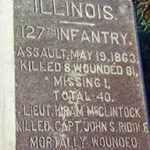 Hiram M. McClintock, of the 127th Illinois Regiment, was among those who lost his life. The Flagg Creek Heritage Society has a collection of Civil War letters that include letters Hiram wrote to Sarah North, a letter from Edward Vial, a letter from a mother to her Confederate son, and a Union nurse’s letter. These letters vividly bring to life this piece of our nation’s history–you can read them online. Hiram, the eldest son of James and Phebeett McClintock, was born October 18, 1840, on a farm located where County Line Road is in Burr Ridge. Hiram became a school teacher and during his tenure at the “Skunk Corners” school (Joliet Road and East Avenue), Sarah North was his student. McClintock’s letters to Sarah are full of tenderness and hint at a relationship that would surely have culminated in marriage had he not died. The letters provide a glimpse of this thoughtful, good-natured young man whose wartime experiences mirrored those of thousands of other young men. 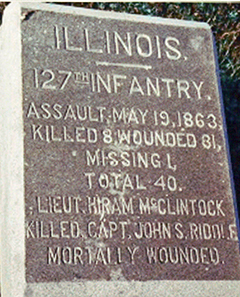 On September 5, 1862, Hiram enlisted in as 1st Lieutenant, Company H, 127th Illinois Regiment. Company H (formed in Lyons) served as guards for Confederates imprisoned at Camp Van Arman, near Camp Douglas in Chicago. In November 1862, the 127thdeparted Chicago via the Illinois Central railroad to Cairo, Illinois where it boarded the steamer Emerald on route to Memphis, Tennessee. On March 13, 1863, McClintock was promoted to Captain. McClintock’s letters relate the Regiment’s experiences up to the Company’s assault on Vicksburg where he was killed. Read the 127th Regimental History, The Union Army, vol. 3 to learn more about the events that Hiram recounts. On January 28, 1889, P.G. Gardener helped organize the La Grange Post 667th of the Grand Army of the Republic which was named the Hiram McClintock Post. His friend, Sarah North (Samuel Vial’s stepdaughter) never married. She taught at the Poet’sCorner school in La Grange Park, Illinois.